In March of 2018, we conducted a survey of the presence of chytrid in the Wetlands region of Ruffner. But what exactly is chytrid? When we speak of chytrid, what we are actually referencing is chytridiomycosis, a disease caused by Batrachochytrium dendrobatidis (“Bd” for short), a fungus in the phylum Chytrid. Bd, first described in 1999, is capable of infecting most of the world’s amphibian population. Chytridiomycosis has been called “the worst infectious disease ever recorded among vertebrates” due to the number of species that are impacted by it, and the fact that it drives amphibian extinctions (Gascon et al, 2007). How does it affect amphibians? Bd thickens the keratin found in the skin cells of amphibians, causing the reduced uptake of water and electrolytes that are absorbed through the skin, eventually causing the heart to stop beating. Some amphibians, such as lungless salamanders, use their skin to breathe – the thickening of which can lead to their suffocation. Not all species infected with Bd die. Some, such as the American bullfrog, are carriers – transporting the fungus to new areas. Humans, too, can unwittingly transfer the fungus to previously uninfected waterways. While some species infected with Bd do survive, most amphibians with chytridiomycosis do not. Chytridiomycosis is so fatal, and moves so fast, that it is contributing to amphibian decline and extinction around the world at an alarming rate. There is some promising research being conducted on chytridiomycosis, and can be treated with a labor intensive process in captivity. There is currently no cure or widely used treatment appropriate for wild populations. Bd has been found at Ruffner Mountain, and though we do not appear to be experiencing mass die offs, we are closely monitoring our amphibian populations. Humans play an integral part in the spread of Bd. Disinfecting all clothing and equipment when visiting waterways, known to be infected with Bd or not, can go a long way towards reducing the spread. 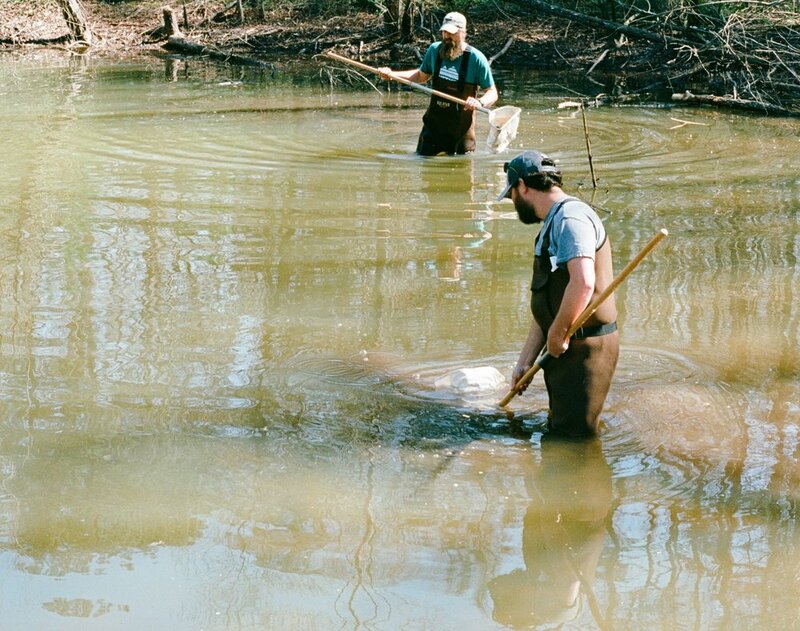 We also recommend strongly against releasing previously captive or captured amphibians to ponds, lakes, streams or any body of water where that specific individual was not previously found. Simply taking a frog from one pond to another can introduce Bd to a previously uninfected body of water. FrogWatch USA is a citizen science initiative that is monitoring frog populations across the United States, tracking declines and population fluctuations. Ruffner Mountain holds a FrogWatch USA Volunteer Certification Class twice a year, between February and August. Check our website for dates, or visit www.frogwatch.org. For more information on Bd, visit http://www.amphibianark.org/the-crisis/chytrid-fungus/.